This menu is Thai vegetrarian food easy to cooking. Thai cooks prefer to use them dried as they have a stronger flavour and more texture. Both types are available in supermarkets and Asian stores. 1. Cut 4 of the shiitake mushrooms in half and slice the remaining 2 pcs. in to thin layers. 2. wash the chinese white cabbage and put them as a bottom layer on a plate. 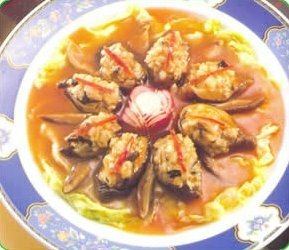 3. mix the rice straw mushroom and the tofu with 1 teaspoon of light soy sauce. 4. Place the half shitake heads on the bed of white cabbage and place the mixture on top of the mushroom heads. 5. mix the pepper, remaining light and dark soy sauce and flour with 1 tbsp of water and stir well. 6. place this mixture as a second layer on the mushrooms. 7. shred the spur pepper and place 1 shred on top of the mixture on the mushrooms. 8. place the plate over hot water and steam for 25 minutes. 9. remove the Het Hom Rad Sod from heat and serve hot.